Four of your BC Crown Counsel Association Directors made the trip across the country to attend two days of meetings. The meetings were attended by all of the criminal and civil associations of Canada except for PEI. On the first day, the Attorney General of Newfoundland & Labrador welcomed and thanked us for the important work we do. This was followed by the President’s report and various other reports of CACC’s involvement over the past number of months. We then spent the balance of the day discussing the challenges and potential solutions various jurisdictions are facing with their respective management and government. The second day commenced with a healthy discussion of Bill 75, an omnibus bill dealing with many matters including changes to bail, preliminary hearings, and peremptory challenges. We then focused our attention on the issue of pensions and how provincial governments across the land are eroding this benefit. Elections for the CACC executive were then held. Congratulations to our very own Jennifer Lopes who continues to be the CACC Vice President. The day concluded with member reports whereby each association provided an update as to what was happening in their respective organizations. 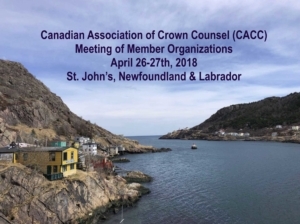 The two-day meeting was very informative, giving us the opportunity to find out firsthand what is happening to Crown prosecutors and Crown lawyers across Canada; and learning how we can make our own association stronger. Of significance to the BC Crown Counsel Association was hearing about the Ontario negotiations and the Federal Department of Justice/Public Prosecution Service of Canada’s arbitration. The fall meeting is scheduled for October 15 and 16, 2018, in Toronto.